University sports stars are hitting new highs, writes Kira Spucys Tahar. Matthew Mitcham is in the 2012 Australian Diving Team. Photo by Lance Richardson. The London Olympic Games will have a strong University of Sydney contingent with over 20 athletes from various disciplines expected to be chosen to represent Australia. The 2012 Olympic Games will start on July 27 and will be followed by the Paralympic Games starting on August 29. At the 2008 Beijing Olympics the University of Sydney was represented by over 20 current and graduate students. It is expected this year’s squad will match or better that number. Not all sports have finalised their teams and more student athletes are expected to be announced as part of the Australian contingent, including up to ten rowers for the Olympic and up to three swimmers as part of the Paralympic squads. All athletes heading to London are either current or former Elite Athlete Program (EAP) scholarship holders. The 10-strong Olympic diving squad will feature two University of Sydney students after Matthew Mitcham and Loudy Wiggins were named as part of the team. Currently undertaking a Bachelor of Arts, 24-year-old Matthew Mitcham will defend his 10m platform diving Olympic championship after he won gold in Beijing. Loudy Wiggins, a Bachelor of Arts (Media and Communications) graduate, will be only the second Australian to compete at four Olympic Games when she joins her partner Rachel Bugg in the 10m platform synchronised diving event. Ms Wiggins was a three time SUSF ‘Sportswoman of the Year’ award winner during her time at University, and won bronze in Sydney and Athens. Joining Jessica Fox (Women’s K1), as part of the canoe/kayak contingent, are graduates Kynan Maley and Murray Stewart. On his Olympic debut, Mr Stewart has qualified for four events in the men’s kayak programme and must now decide which events he will contest in London, likely only two. Mr Maley is also on debut at the London Olympics and will compete in both the single and double slalom canoe events. Cyclist and University of Sydney graduate, Kaarle McCulloch, will make her debut at the 2012 Olympics in London after being named as part of the Australian track cycling team. She will compete with fellow Australian Anna Meares in the women’s team sprint. At this year’s world championships, the pair won silver after a narrow defeat to their German competitors. Master of Commerce student Edward Fernon will represent Australia in the Modern Pentathlon. Mr Fernon qualified at the end of 2011 and was the first University of Sydney Business School and Sydney Uni Sport & Fitness scholarship holder to qualify for the London Olympics. Mr Fernon trains seven days a week in order to master the elements of fencing, freestyle swimming, showjumping, cross-country running, and pistol shooting required for his event. With regard to the Paralympic squad, Jennifer Blow has been selected as part of the Goalball team for the London Games. 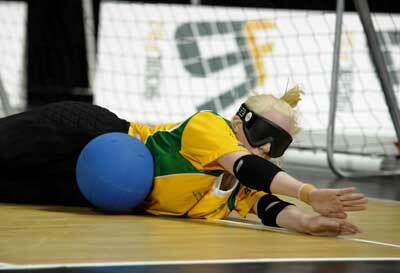 Goalball is a sport invented in 1946 designed exclusively for athletes with visual impairment. The object of the game is to roll the ball into the opposition goal while players try to block the ball with their bodies. There are bells inside the ball to help orient the players, so while play is in progress, complete silence is required in the venue. Ms Blow is currently undertaking a B. Arts/ B. Education and is one of six athletes selected in the Australian team. It is highly likely an in-form Sarah Stewart will also join the Paralympic squad, and be selected this week as part of the Australian wheelchair basketball team that will compete in London. Ms Stewart was part of the team that took part in the official London Paralympic qualifying tournament in South Korea last year. Last week Ms Stewart, who is currently undertaking a PhD in Philosophy, showed impressive skill as part of the silver medal winning team at the Paralympic World Cup in Manchester. If she is given a spot on the team, this will be Ms Stewart’s third Olympic Games after winning silver in Athens and bronze in Beijing. Five members of the Sydney University Football Club have been named as part of the Wallabies 39-man training squad for the June tests. Dave Dennis who is undertaking a Graduate Diploma in Commerce, and Bernard Foley, who is completing a Bachelor of Economics, are both Sydney University Elite Athlete Program (EAP) scholarship holders. The three other men, Berrick Barnes, Ben McCalman and Nick Phipps are all former scholarship recipients. All five currently compete for teams in the Super Rugby competiton; Barnes, Dennis and Foley for the Waratahs, McCalman for the Western Forces, and Phipps for the Melbourne Rebels. Wallabies coach Robbie Deans will announce his 23-man team on June 3 ahead of the Wallabies v Scotland test on June 5 in Newcastle. There are a further three tests, this time against Wales, including a match on Saturday June 23 in Sydney. It is hoped there will be a strong University of Sydney presence as part of the team. Full list of Sydney University past and present Olympians.